The story of custom wheat harvesters is one of a kind. That is the simple reason Conrad Weaver quickly grew passionate about telling their story. The Great American Wheat Harvest documentary shares the story of the hard working folks who harvest the wheat we use daily and Conrad knew FFA members from across the country could learn many life lessons through it. 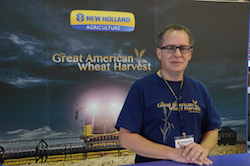 While at the 89th National FFA Convention students will have the chance to receive a LIMITED EDITION copy of the Great American Wheat Harvest movie. This limited edition will only be available to FFA Chapters. They have printed more than 8,500 copies to distribute to chapter leaders so if you know someone who will be at convention, please encourage them to stop by the New Holland Agriculture booth in the exhibit hall to pick up their copy.